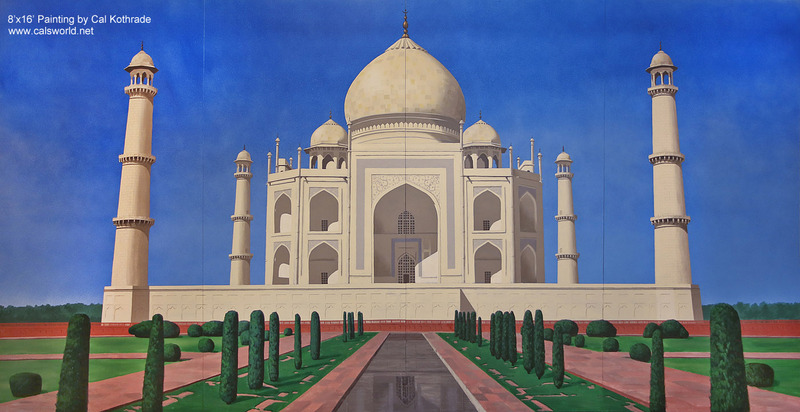 Large Murals are painted on muslin and can be shipped. Portraits and landscapes can be commissioned from your photos. Please email or call me for price quotes. If you don't see text links on the left side of the page click here! 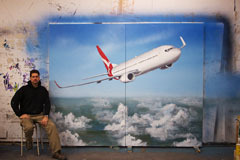 Acrylic latex on overhead door. Size is 10 feet tall by 14 feet wide. 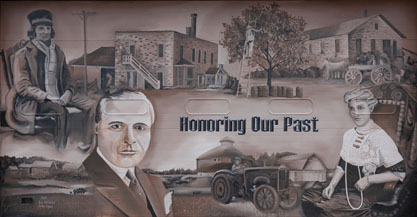 Painted as a commissioned piece for the outside of New Berlin Historical Museum. 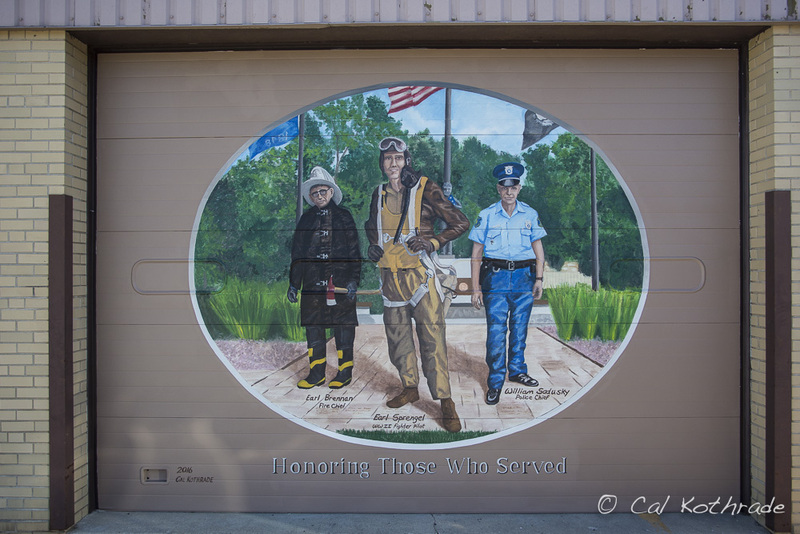 Painting depicts the first fire chief, first police chief of New Berlin, WI and a favorite son ot the community, a WWII fighter pilot. Painted in fall of 2016 by Cal Kothrade. Original design and concept by Cal Kothrade. Acrylic latex on wood panels (4). Size is 8 feet tall by 16 feet wide. 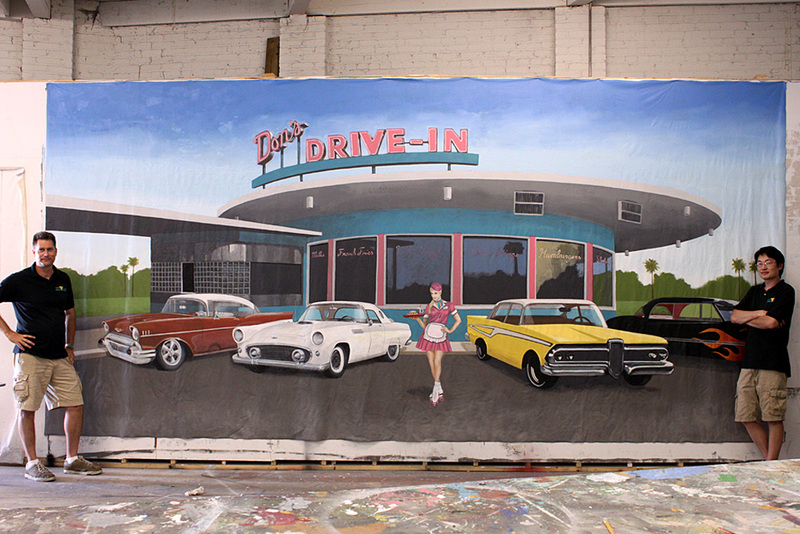 Painted as a rentable backdrop for a prop rental business in Milwaukee, WI, with the help of Ben Lowery. Acrylic latex on concrete block. 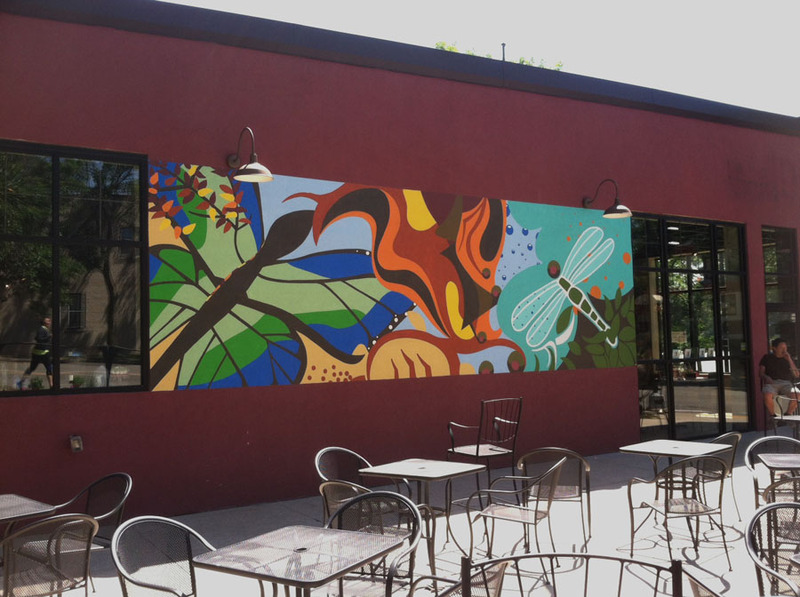 Painted as a decorative mural for a private business in downtown Wauwatosa, WI. Arte' is an art and wine bar that was looking for some extra curb appeal. 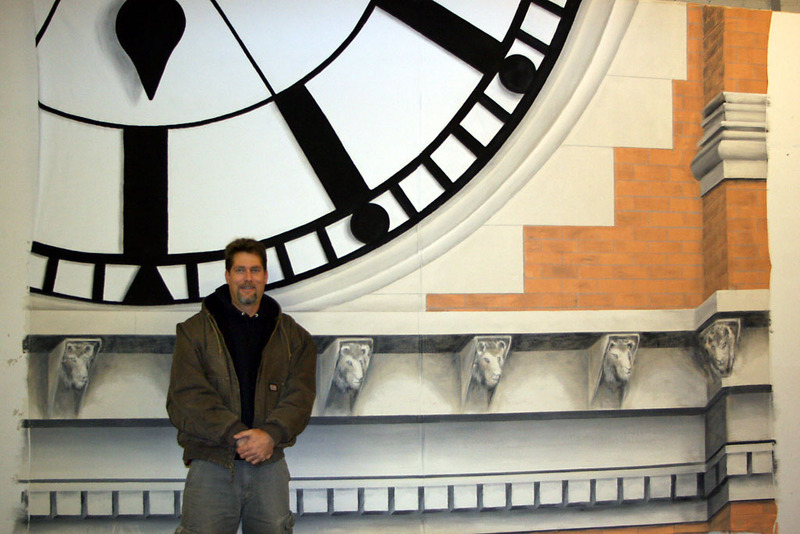 The painting was completed in less than a week with the help of Ben Lowery. Acrylic on Canvas. Size 8'x20'. 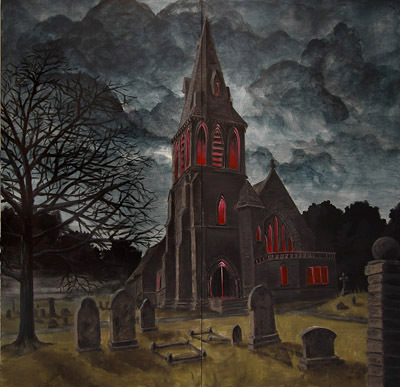 Painted as a backdrop for a haloween display for Green Bay Packers football organization. Painting is in private collection. Acrylic on drywall. 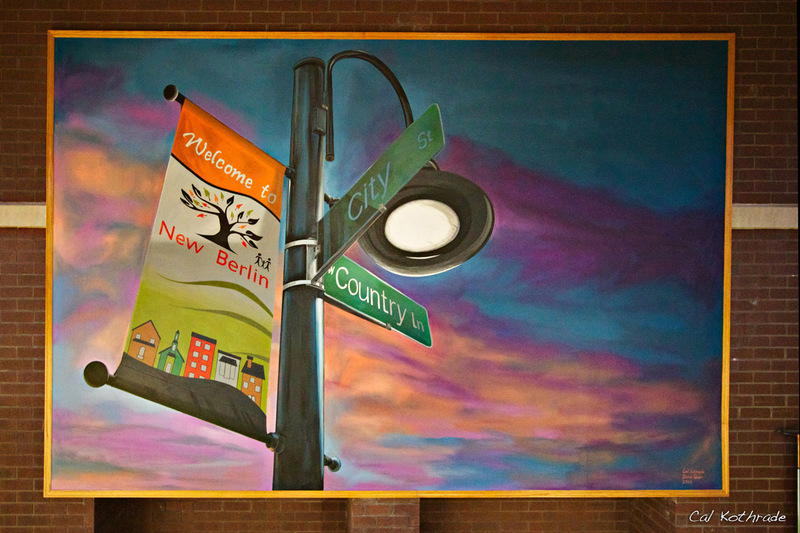 Painted for City of New Berlin, WI inside City Hall. 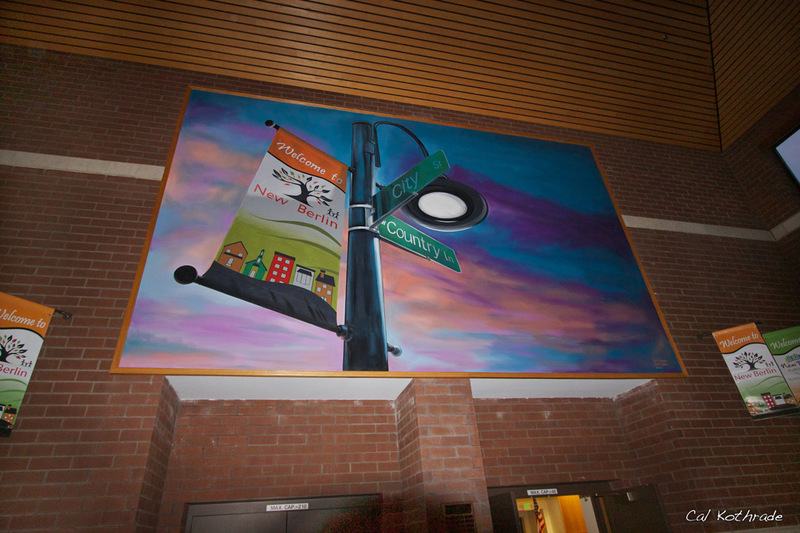 Painting symbolizes the country roots of a suburban community and it's growing city side. Size 20'wide by 14'tall. Mural's bottom edge is 9' from floor. Painted onsite using scaffolding. Time to complete 3 days. 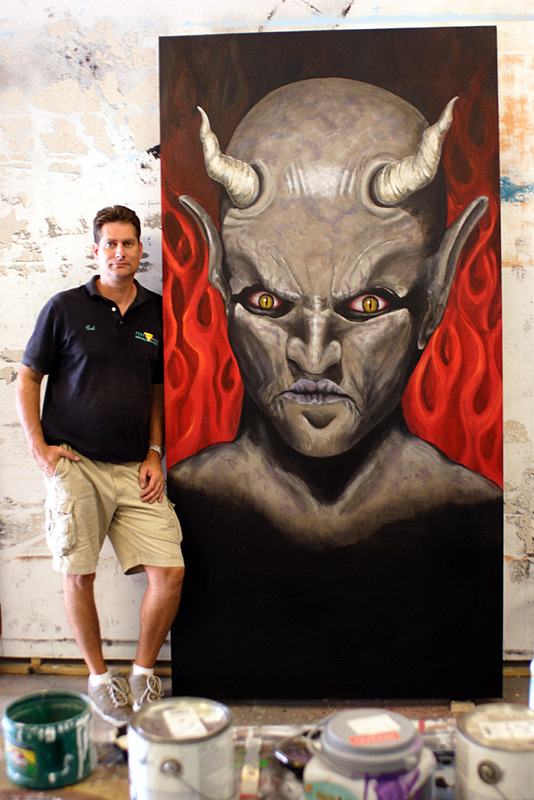 Painted in conjunction with David Gass. Acrylic on overhead door. Painted for City of New Berlin, WI Historical Museum. 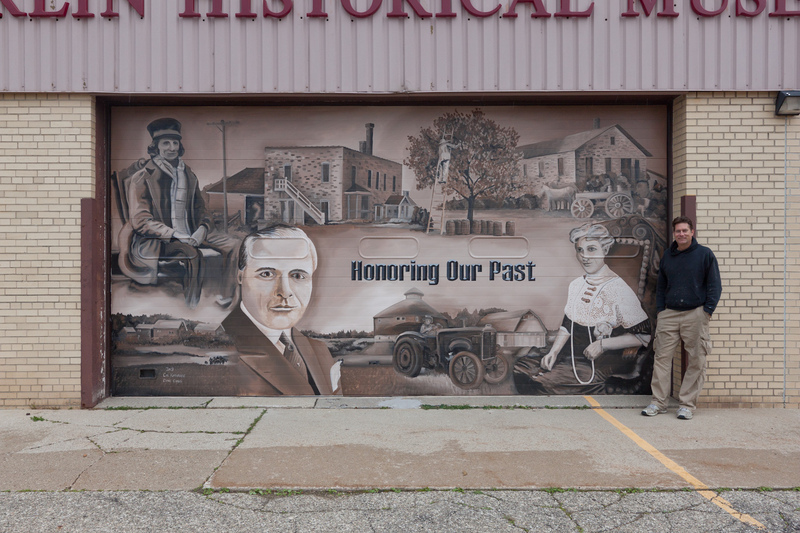 Featuring notable places and people significant to the city's history. Size 10' x 20'. Painted in conjunction with David Gass. Acrylic on canvas. Hand painted from a client's family vacation photo. Size 20" x 20"
Acrylic on wood bench. 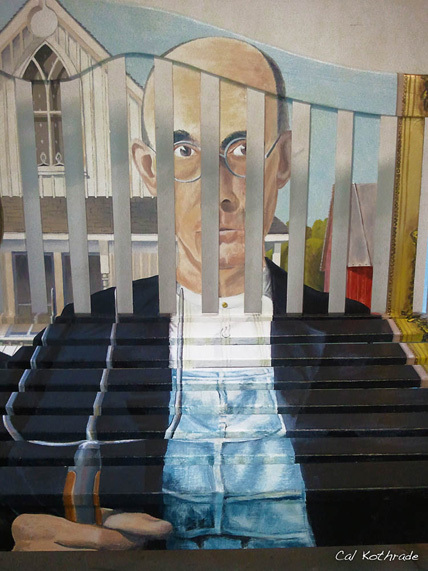 A hand painted reproduction of Grant Wood's masterpiece "American Gothic"
Acrylic on canvas, size 16 by 20 inches. 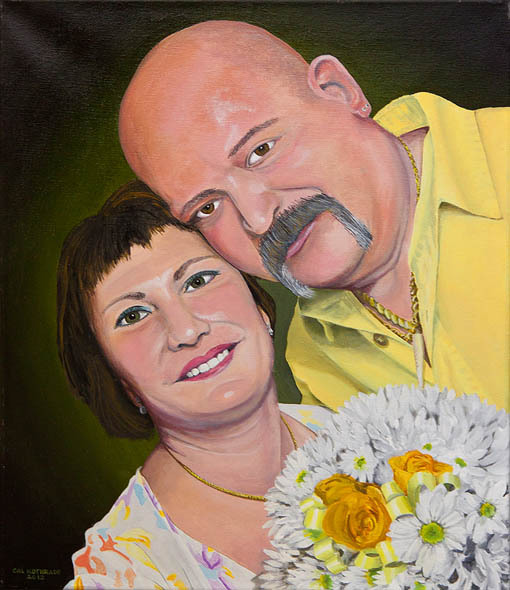 Commissioned as an anniversary gift, painted from a 4x6 photo. 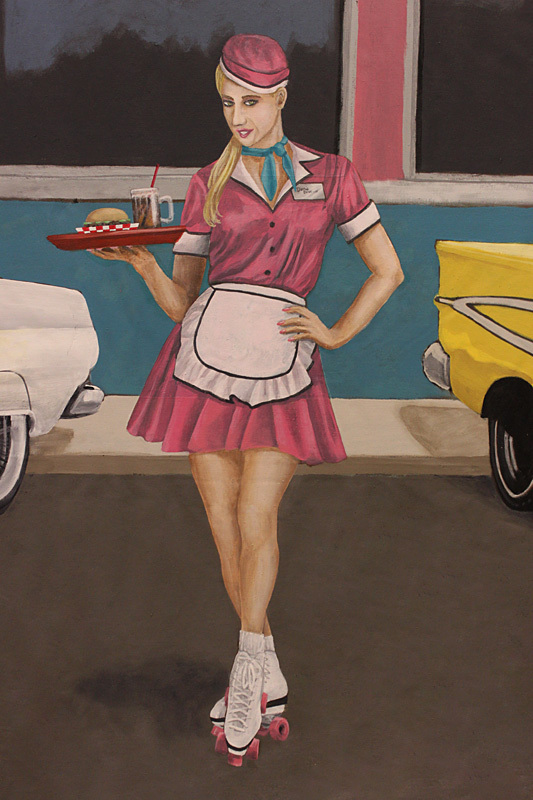 This painting is size 8 feet by 8feet, latex housepaint on luann panels (2). 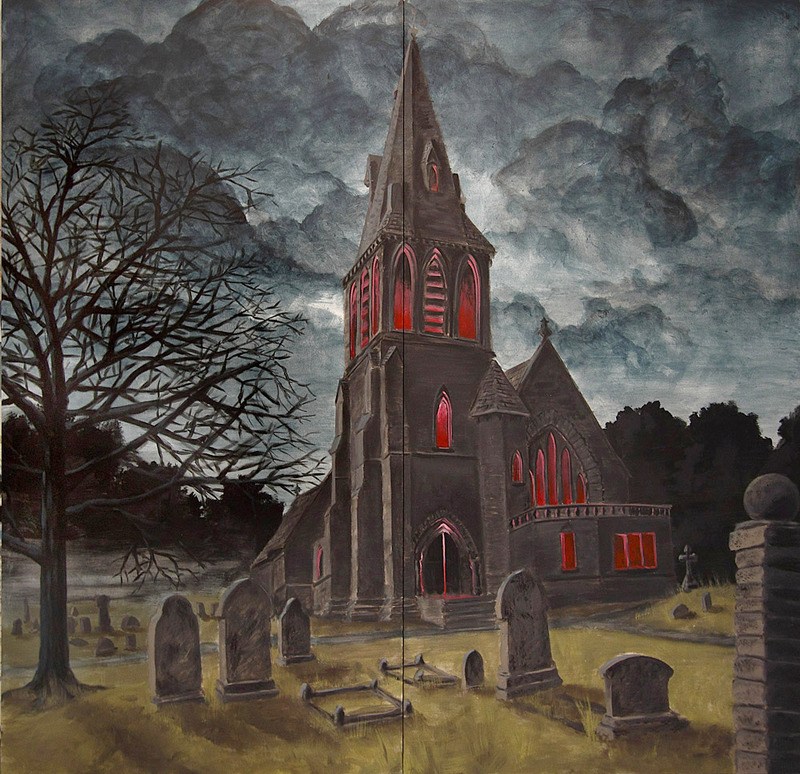 This was painted as a backdrop for a 3 dimensional vignette for a Halloween display. Working time approx. 8 hours. 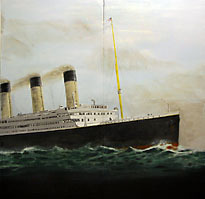 Painting is in private collection. 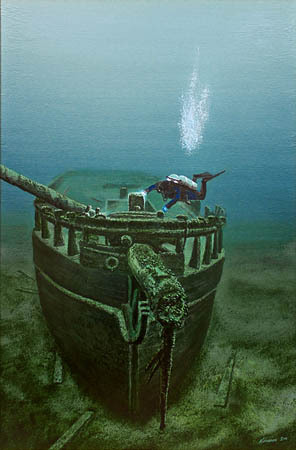 This painting is an acrylic on canvas depiction of a lone diver exploring the bow of the Port Washington, WI area shipreck. 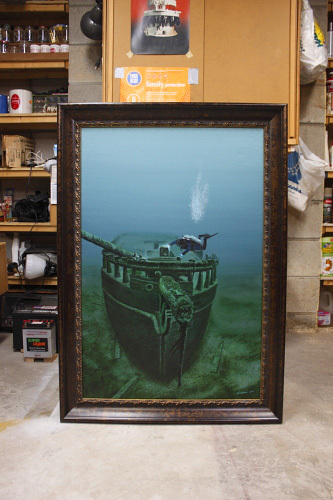 The painting is 24" by 36" but with the included frame measures slightly larger. 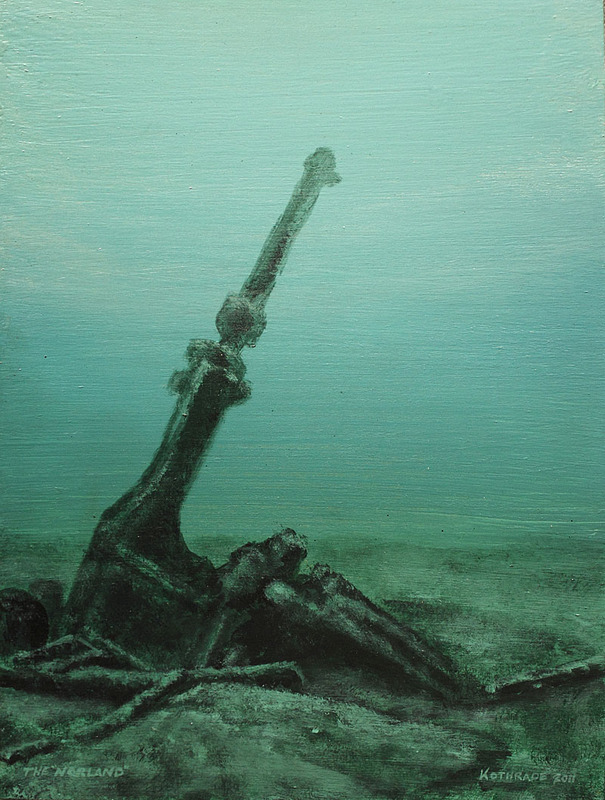 The painting is signed on the back by the artist and the actual diver depicted. This extraordinary piece of maritime fine art is ready to hang and will make the boldest of statements in any room. Painting is sold. Giclees are available, please contact Cal. 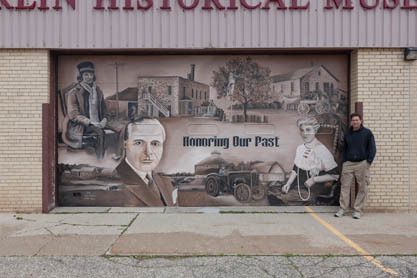 This mural is 10 feet wide by 8 feet tall, and was painted on two separate wood frames stretched with muslin. I have photoshopped the gap between the two panels out so that the painting as it was intended can be viewed. No other changes were made to the image and it accurately depicts the real painting. These paintings are smaller than I usually work, only 9" by 12". The Northerner is the view of the stern with it's debris field. The Norland depicts the huge rudder and rudder post that rises up out of Lake Michigan's clay bottom over 15 feet high. Both paintings are from my original photographs and are acrylic latex on 1/8 inch board. Both paintings are sold. Giclees are available, please contact Cal. 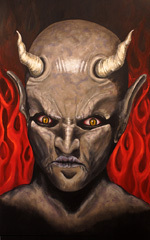 This painting was done to match other similar styled portraits of Halloween charachters in a private collection. Acrylic on wood, size 4' by 8'. Due to constraining parameters, the bottom of the painting was intentionally left black to match other portraitsthe collection. Total painting time about 8 hours. 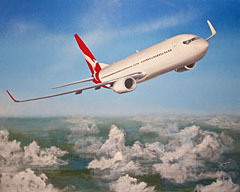 A reference image found on the internet was used for this painting. This painting is a commissioned piece for a fellow diver. Acrylic on canvas, size 15" by 20". 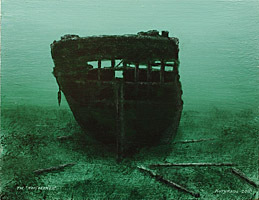 This was painted from a photograph taken by the client, of a shipwreck off of Port Washington, WI. The Northerner went down in 1868 while being towed to Milwaukee for repairs. No lives were lost. 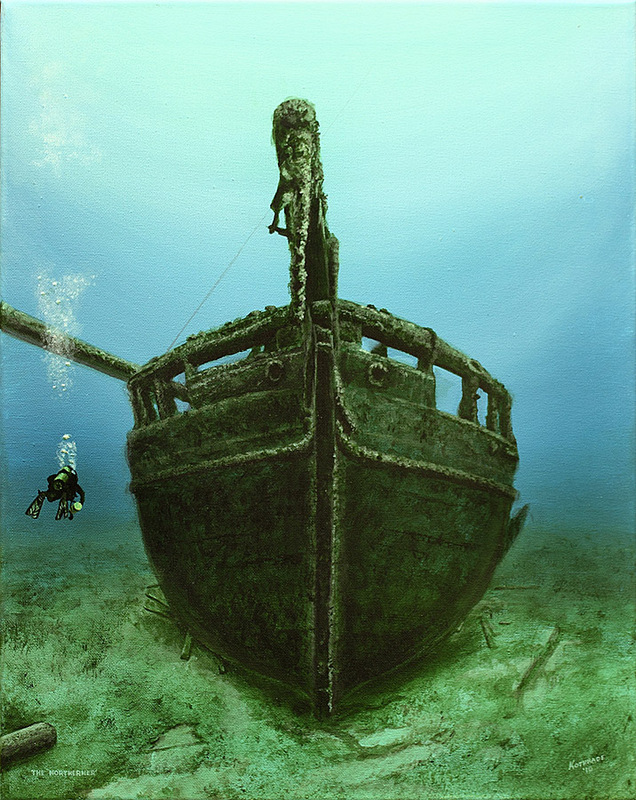 The wreck is a popular dive site for divers, sitting in 130 feet of water. This painting is a collaborative effort between Ben Lowery and myself. Latex on muslin, 10' tall by 20' wide. 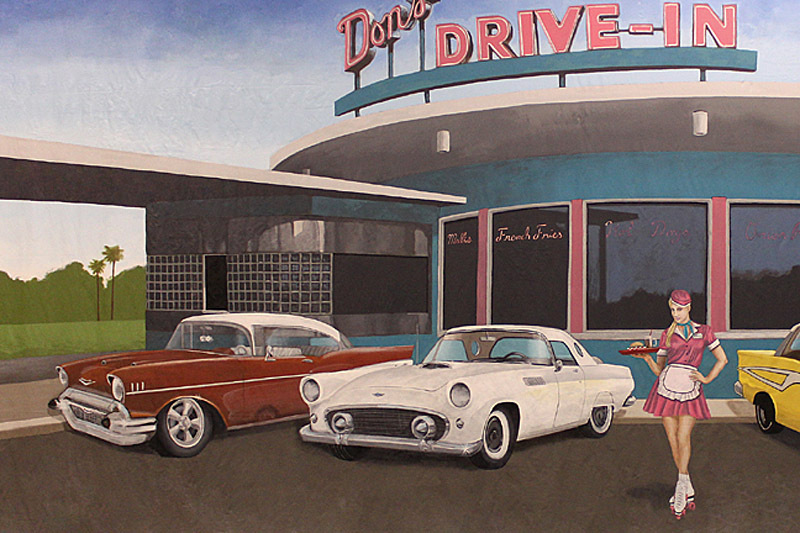 Photographs of an actual diner were used as a basis for "Don's" but some elements have been changed. About 30 hours painting time for each of us on this mural. Originally designed to be two individual portraits of pirates, this was painted in stages. Made from 4 separate 5' wide by 10' tall panels, when put together the full mural is 10 feet tall by 20 feet long. The seams where the panels join together have been photoshopped out to minimize the visual distraction. Several months ago I painted the panel that contains the pirate on the left and my coworker Ben Lowery painted the pirate panel on the right. We painted the backgrounds in the same manner so the two portraits would appear as a matched set even though they were to be displayed apart from one another. Several months later I still felt like the story had not been properly told so I painted two more panels to complete the full image I had in my mind's eye. . . 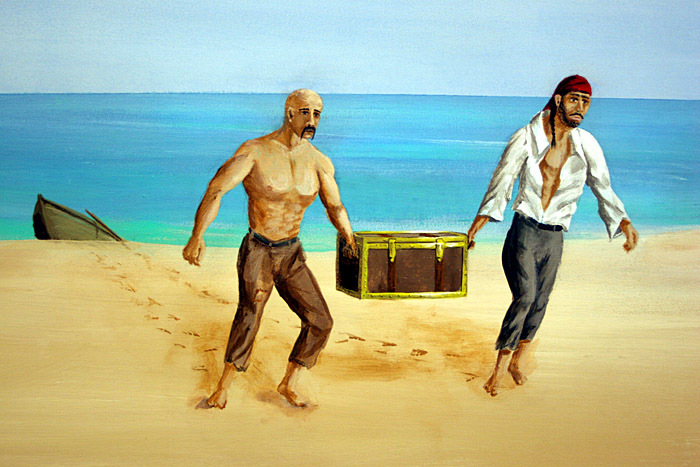 The captain and his close friend and partner in crime, the first mate, have come ashore to personally oversee the burying of the treasure. They have chosen a beautiful yet desolate and uninhabited island to hide the latest plunderings. While some of the crew remains behind to stow the sails, others are dispatched in longboats to bring the loot ashore while the proud captain and first mate scout the perfect spot to dig. 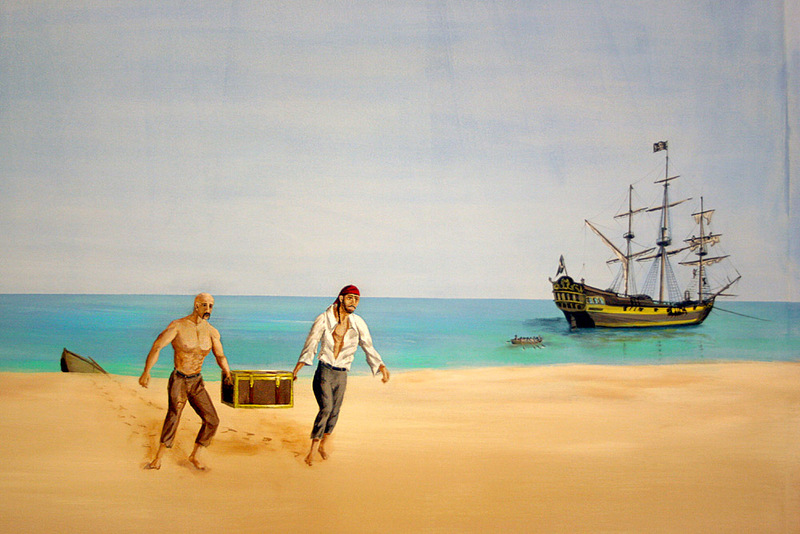 Items of interest: rivet detail on the brass framework of the second chest, two pirate flags proudly flying in the breeze on the ship, no less than 15 people in this painting, a welcome rainshower in the distance to the left, and a distant cliff inspired by the movie "Castaway"
This painting is a backdrop mural for Milwaukee's City Hall to help celebrate the completion of the exterior refurbishing and the building being added to the national register of historical places in December, 2008. 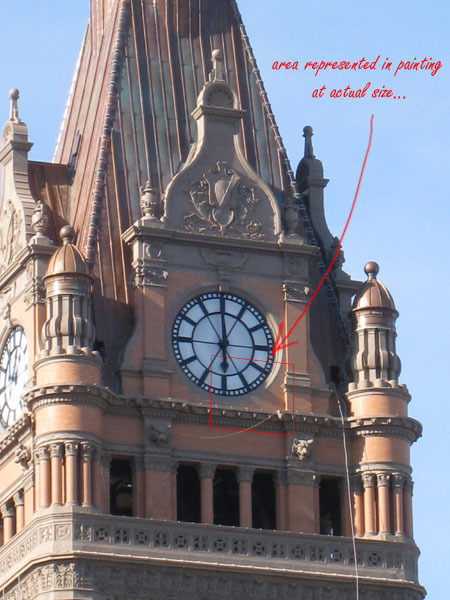 The mural will be displayed with a section of scaffolding in front of it and used for photo-ops, allowing the person/persons in the picture to appear as though they were actually on the work scaffolding in front of the awesome stonework, lionheads, and clock. 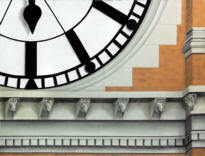 The mural measures about 12' x 9' and represents one of the clock tower's faces at actual size (over 15 feet in diameter). 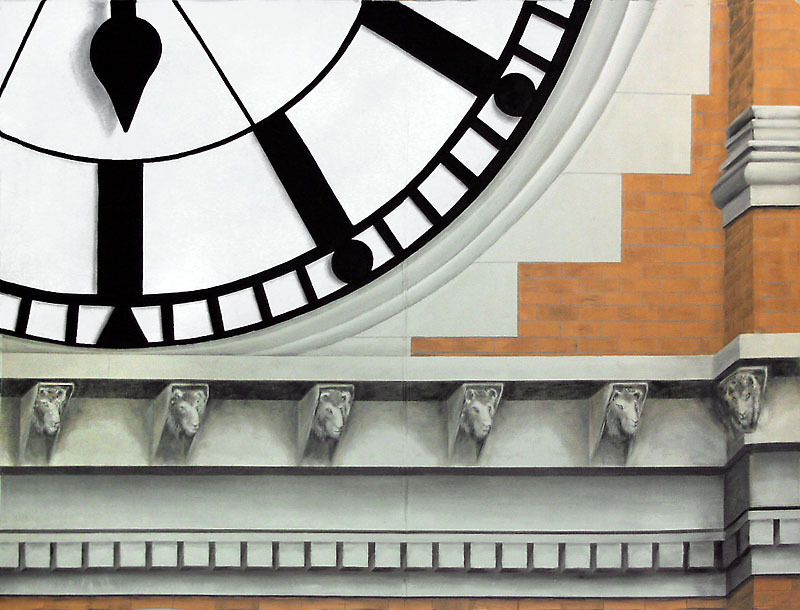 It is painted as if the viewer were looking up and slightly to the right as the actual clock face is over 200 feet above the sidewalk. Acrylic latex on canvas, 4 colors, 19 hours. 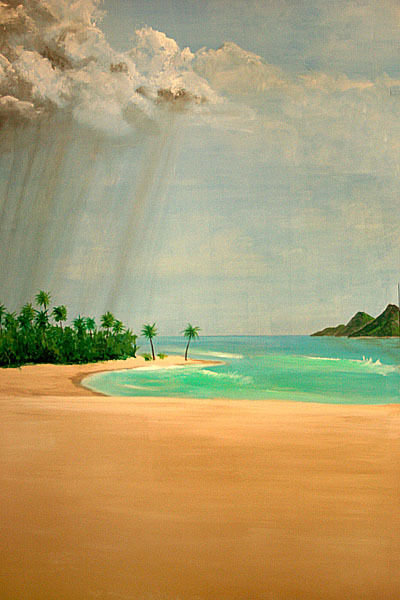 This painting was done on muslin using interior latex house paints. 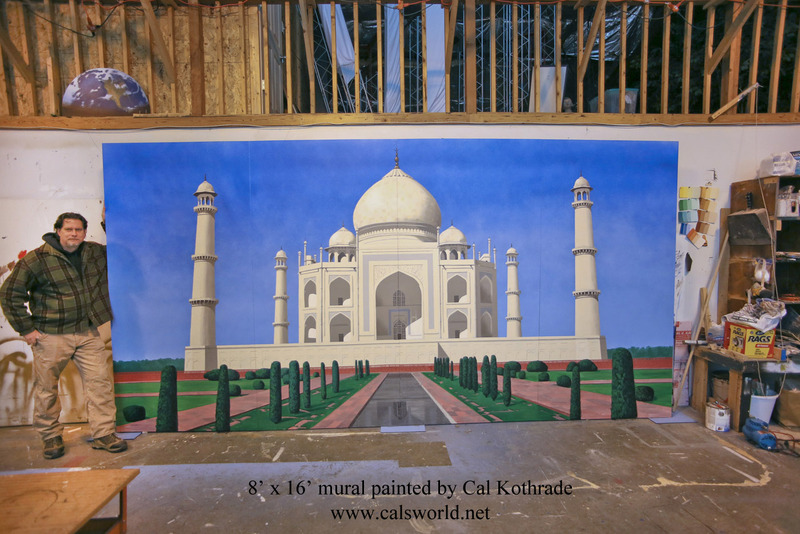 The mural is 8 feet high by 8 feet long, was painted on two 4' x 8' canvases in vertical orientation for ease of transport and took 4 hours total to complete. 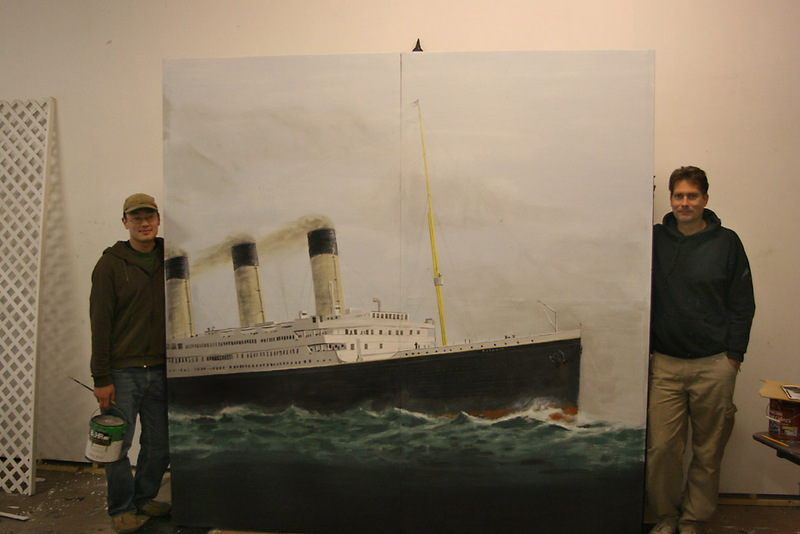 This is a replica of a portion of a full size painting of the Titanic by someone else and is not our original concept. Our client specifically requested this section of the artists work to be replicated as well as the aspect ratio. 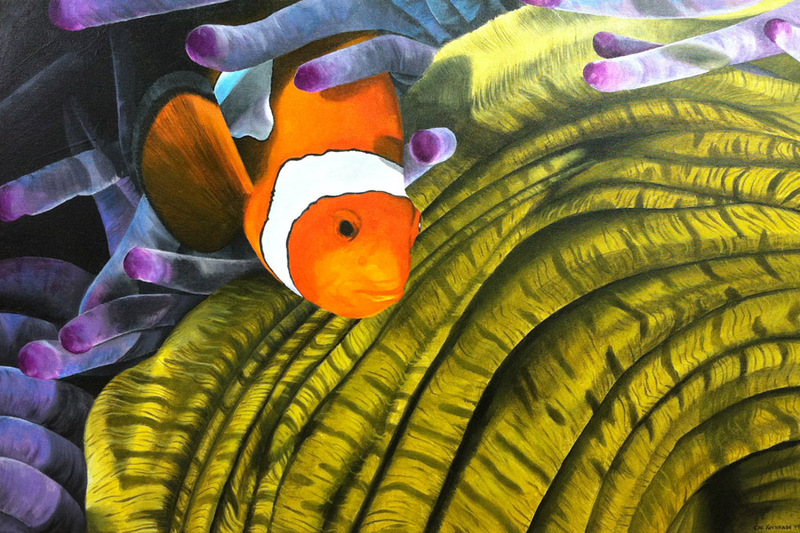 The painting was created in tandem by myself and Ben Lowery, a talented MIAD graduate. Responsibilities were shared equally as both panels were painted by both of us simultaneously so as to keep a consistent style throughout as opposed to each of us taking our own 4x8 panel and joining them together when we were done. The joint partnership was due to time constraints. 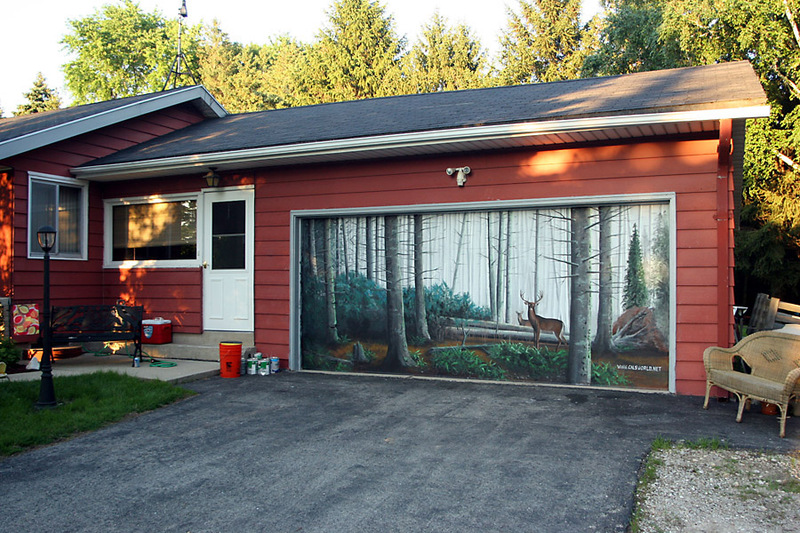 This original painting was done on a garage door using interior and exterior latex house paints. 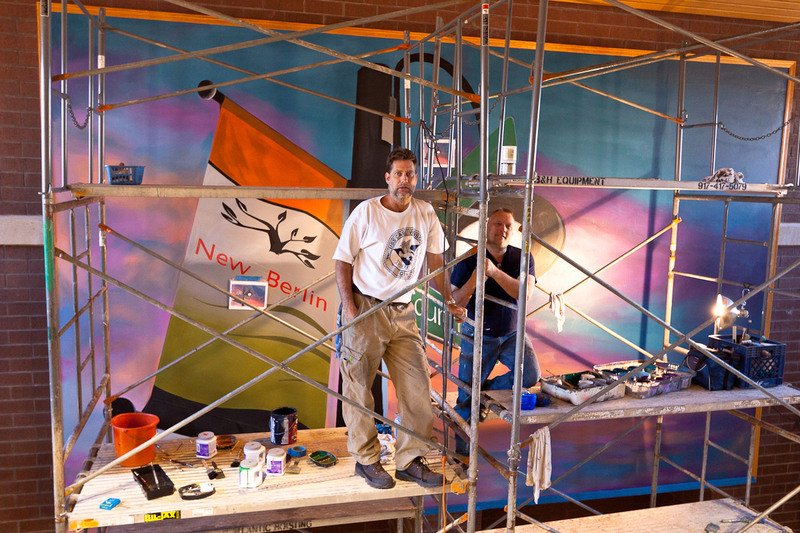 The mural is 7 feet high by 16 feet long and took about 18 hours to complete. This was commissioned work and followed preset guidelines from the homeowners. After an initial meeting a proof was created in Photoshop and approved before any work began. 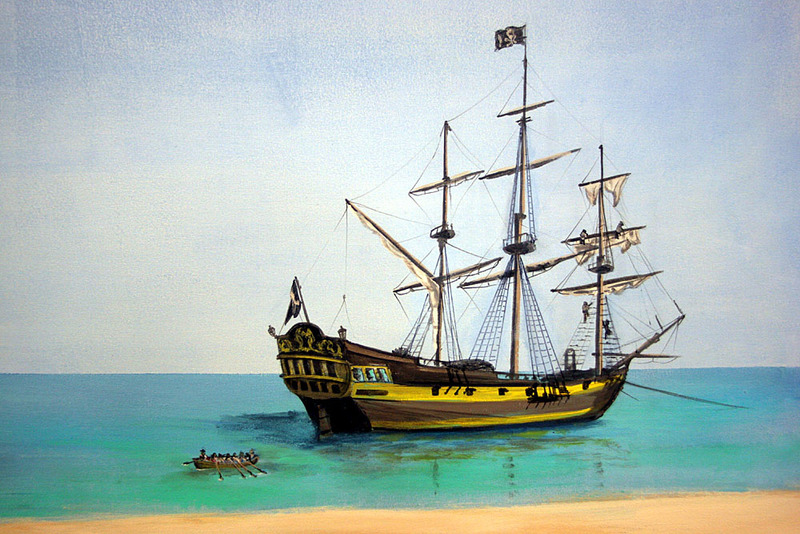 This original painting was done on muslin using interior latex house paints. 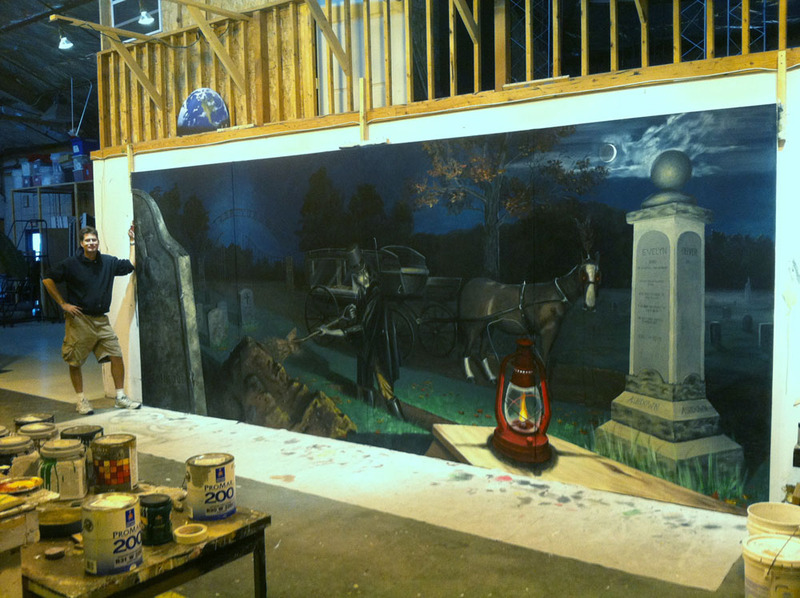 The mural is 10 feet high by 20 feet long and took about 12 hours total to create. 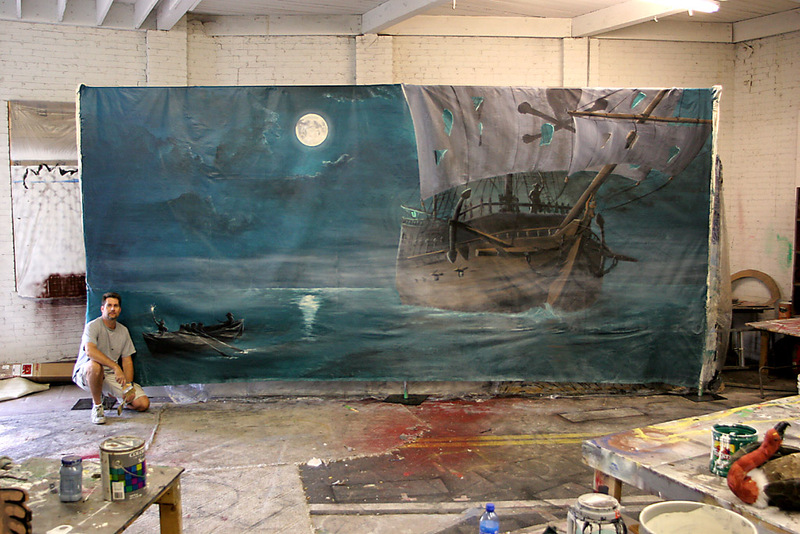 This was commissioned work and was to be a spooky halloween pirate/ghostship backdrop for a display vignette. Original idea was sketched out on paper first then painted using several photos for reference. Painting is currently not for sale, though it can be rented from "Props Unlimited" in Milwaukee, WI for private parties/events. queen Betty Page and was painted by hand on MDF board. Painting measures 20" x 30"
Full size, high quality lithographic prints of this painting can be purchased for $15.00 plus shipping. Email me. Painting is currently for sale. 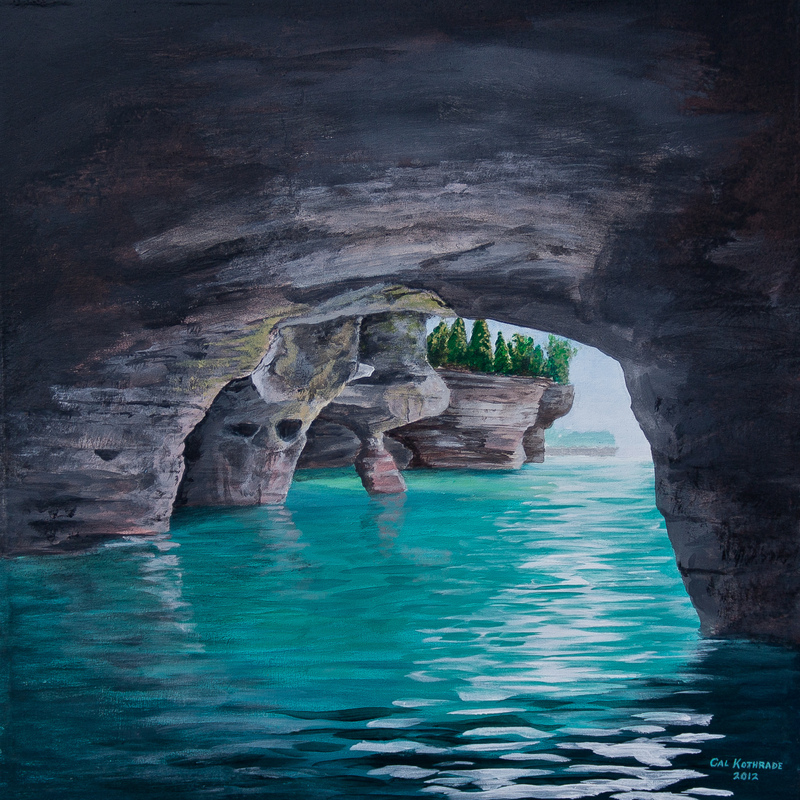 This original painting was done on muslin using interior latex house paints. 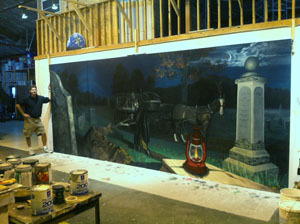 The mural is 10 feet high by 20 feet long and took about 1.5 hours to complete. 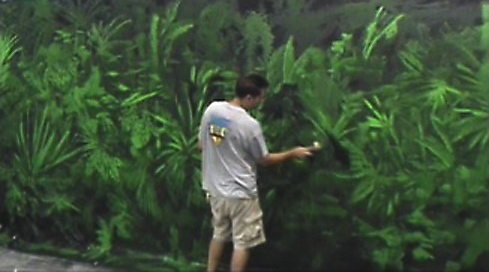 This was commissioned work and was used as a wall covering in an entry stairwell at a soccer stadium that was being rented for a corporate tropical themed party. A second nearly identical mural was created for the other half of the stairwell. This original acrylic is inspired by one of my own photographs from a European fashion photoshoot taken in 2007. 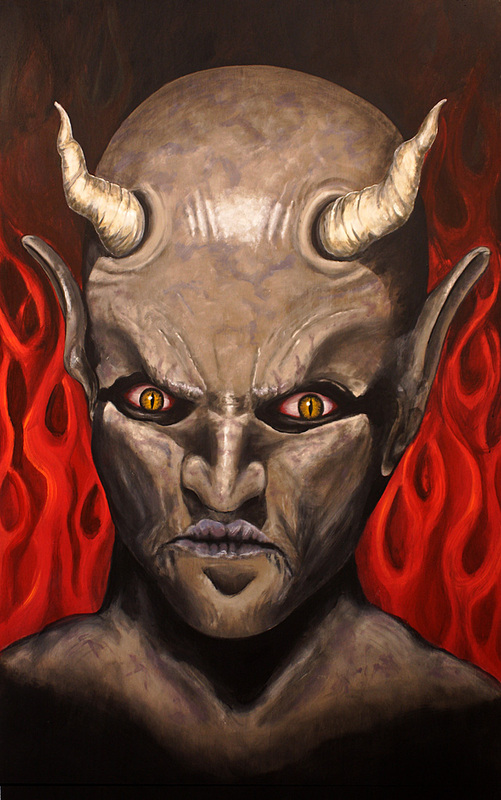 The original painting is acrylic on board, and measures 12 x 24 inches.